Now Version 2.60. 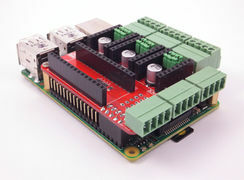 The RPI CNC Board combines a real-time CNC controller(Micro-controller running GRBL) with a powerful credit card size computer(Raspberry Pi). 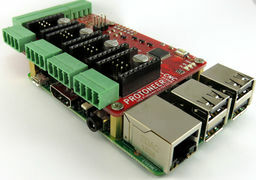 By combining the two systems we have created an eco-system where the Raspberry Pi provides benefits like: Processing power, connectivity(IOT) and a well supported community. 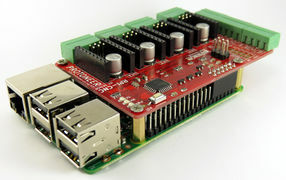 The board plugs directly into the Raspberry Pi General Purpose Input/Output pins, with the micro-controller and Raspberry Pi communicating via serial. (/dev/ttyAMA0). 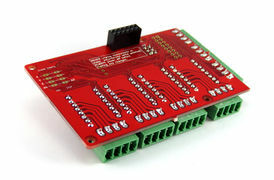 We recommend the Pololu DRV8825 driver carrier boards to complete this CNC Board, sold separately. IMPORTANT: None of the components should be powered while installing or configuring. 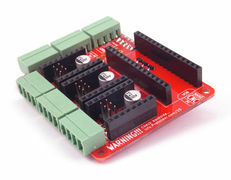 WARNING: Do not power up the board with stepper drivers installed if they are not connected to stepper motors. 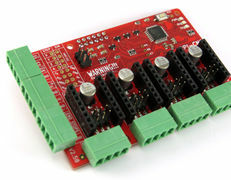 The stepper drivers are current limiting and will overheat if they are not connected. In the tables below High indicates that a Jumper is inserted and Low indicates that no jumper is inserted. End Stops use normally-open push-button type switches. 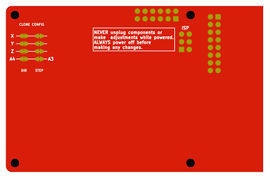 The End-stop socket shares a common ground that connects to each axis end-stop. 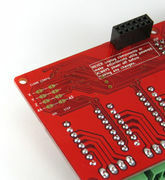 The pins are pulled high by the micro controller's internal pull-ups and will activate the end-stop when the pin is connected to ground. GRBL v0.9 setting $21 needs to be set to 1 to activate hard-limits. Setting $22 also activated the Homing functionality. V2.51 Introduces End-stop and Probe line filters to prevent noise on the lines. 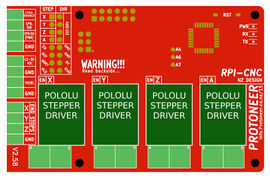 The 4th Stepper Driver Socket can be configured to clone any of the other Axes. Configuration is done with the two rows of solder-able jumpers situated under the board. 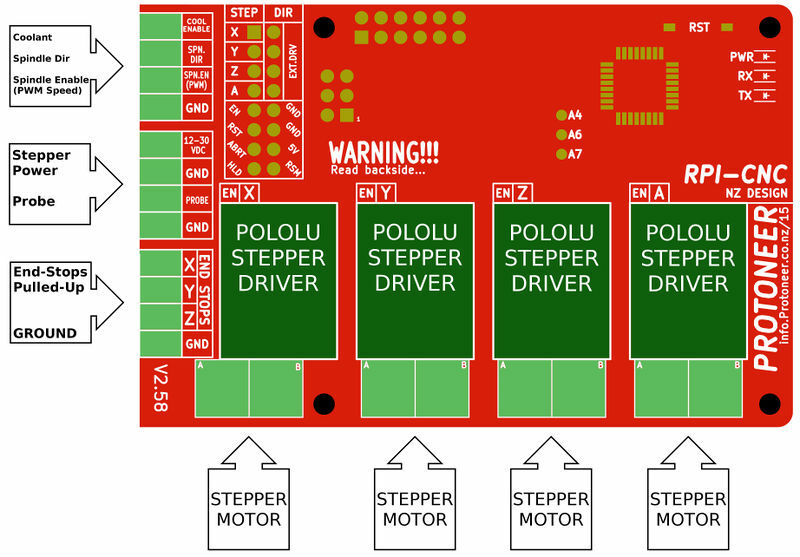 In the images above the green sections indicates a jumper positions to configure the 4th Stepper Motor Socket. Special attention needs to be taken with the Enable pin. Pololu Drivers activate when the enable pin goes low/grounded. 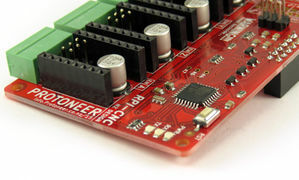 If the external drivers you are using needs active high you will not be able to use the enable pin but can instead just connect the external drivers enable pin to 5V to enable it. The buttons : RESET,ABORT,HOLD,RESUME work with normally open buttons and gets activated when grounded. All buttons are pulled high. M3 / M4 - Enables the spindle clockwise or anti-clockwise. The Spindle Direction pin is set accordingly(Anti-clockwise turns direction pin high). Sets the Spindle speed pin accordingly. M5 - Disables and pulls spindle pin low. Examples: M3 S500 -> Enables spindle in clockwise direction at 50% speed. Keep in mind that the direction pin does not reset when the M5 command is used. M8 - Enables the coolant and pulls the pin high. M9 - Disables and pulls the pin low. As of this version firmware can directly be upload from the Raspberry Pi. Firmware gets uploaded from the Nano's usb port. GRBL is the magic that does the actual control of the CNC machines. 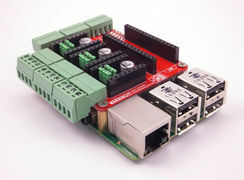 Add reset circuitry to enable programming directly from the Raspberry Pi. ISP pins added and preloaded with the Opti-Boot bootloader. This opens the door for other firmwares like Firmata. 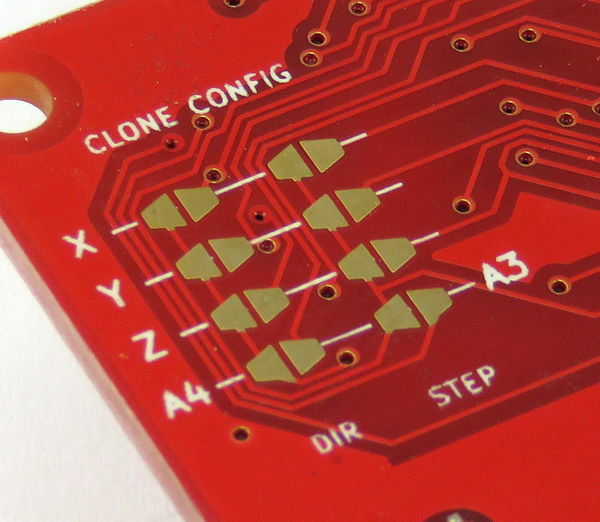 Replaced clone jumpers with solder-able jumpers. 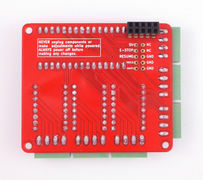 Later batches might have dip-switches instead of Jumper headers. 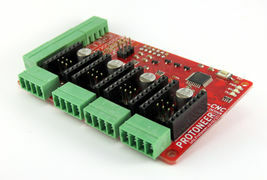 First Protoneer board to be mode on our Pick and Place machine. 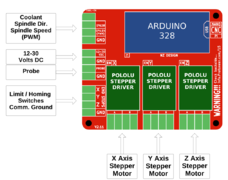 Extra Stepper Drivers Socket that can clone one of the other Axes. End-stop + Probe line noise filters. Allows end stops to work with normal un-shielded cable. 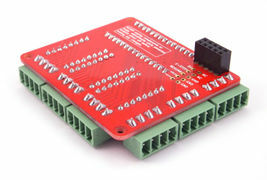 Breakout pins allowing external Stepper drivers to be hooked up.